Inauguration of the 101st General Assembly in Springfield. 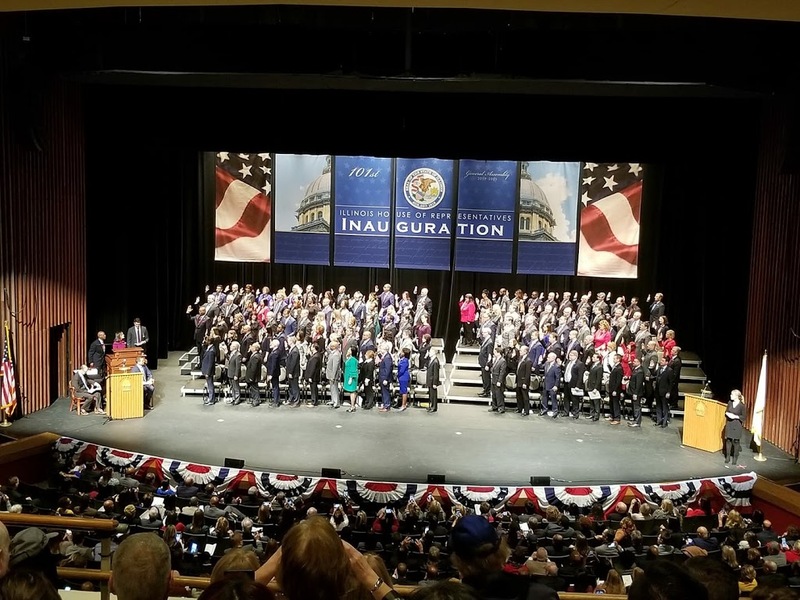 State Representative Jeff Keicher, R-Sycamore, was sworn in for his first full term on Wednesday, joining all 118 members of the Illinois House of Representatives for the inauguration of the 101st General Assembly held at the Sangamon Auditorium on the campus of the University of Illinois at Springfield. Keicher has represented Illinois’ 70th District since July 2018 serving portions of DeKalb, Kane and Boone Counties. The House of Representatives for the new 101st General Assembly is comprised of 74 Democrats and 44 Republicans. Representative Michael J. Madigan of Chicago was re-elected Speaker of the House for another two-year term. Representative Jim Durkin of Western Springs was re-elected Minority Leader. Representative Keicher is a graduate of Northern Illinois University with over 20 years of professional experience in the insurance industry. In 2006, he opened his own State Farm Insurance Agency in Sycamore. His community involvement includes having held executive board positions with the Sycamore Chamber of Commerce, the Sycamore Public Library, the National Association of Insurance and Financial Advisors (NAIFA) of Illinois and the Sycamore Rotary Club. He also spent many years serving on boards for the DeKalb Chapter of the American Red Cross, NAIFA Fox Valley, and the Kishwaukee YMCA. Representative Keicher’s committee assignments for the 2019-2020 legislative session will be announced in the coming weeks. For questions or more information, please visit www.repkeicher.com or call the District Office at (815) 748-3494.